Visual Studio 2017 has arrived and because of .NET Core and other goodies we wanted to switch fast to the newest release with our product OneOffixx. In our solution we use some VC++ projects (just for Office Development & building a .NET shim), Windows Installer XML & many C# projects for desktop or ASP.NET stuff. Our builds are scripted with CAKE (see here for some more blogposts about [CAKE}(https://blog.codeinside.eu/2017/02/13/create-nuget-packages-with-cake/) and us the TFS vNext Build to orchestrate everything. The first step was to update my local dev enviroment and install Visual Studio 2017. After the installation I started VS and opened our solution and because we have some WIX projects we needed the most recent Wix 3.11 toolset & the VS 2017 extension. We wanted a clean VS 2017 enviroment, so we decided to use the most recent VC++ 2017 runtime for our VC++ projects. In the past we had some issues that MSBuild used the wrong MSBuild version. Maybe this step is not needed, but we pointed all .csproj files to the newest MSBuild ToolVersion 15.0. The last step was to update the CAKE.exe (which is controlled by us and not automatically downloaded via a build script) to 0.18. We needed to adjust some paths (e.g. to the Windows SDK for signtool.exe) and ensure that we are using the most recent MSBuild.exe. 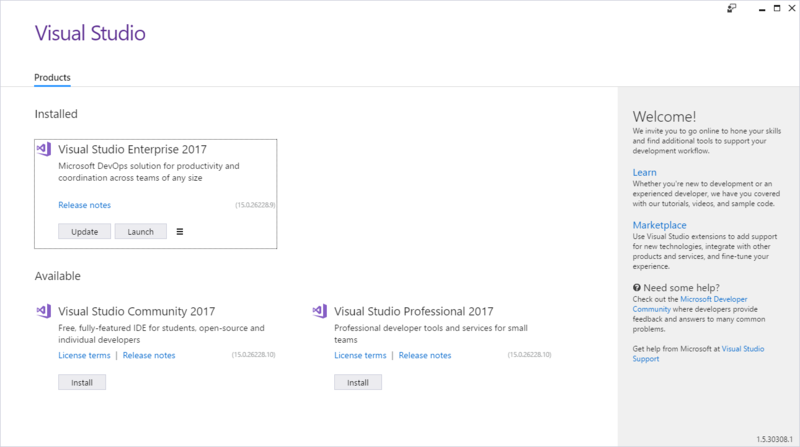 Besides the C++/COM/magic issue (see above) the migration was pretty easy and now our team works with Visual Studio 2017.